To the left the Alpha female called Lightgirl and to the right Lightboy. To the left Gandalf the Alpha male and to the right Lightboy. Going back to Finland is always thrilling, and with an expectation of being able to see something new or experiencing something magic. This trip delivered on both parts. Going to Finland in September does not allow for many hours to photograph so you have to have luck in the small window you have. We leave the camp at around 4 pm. and the sun sets at 8 pm. The pictures above is the biggest bear I've ever seen. My estimation is that he weighs somewhere between 300-350 kg. And he has name of course; "Brutus". Brutus dominates the area with his presence and pondus. This however doesn't prevent other bears coming into the area. In total we saw 6 individuals on this trip, including a mom with two yearling cubs. 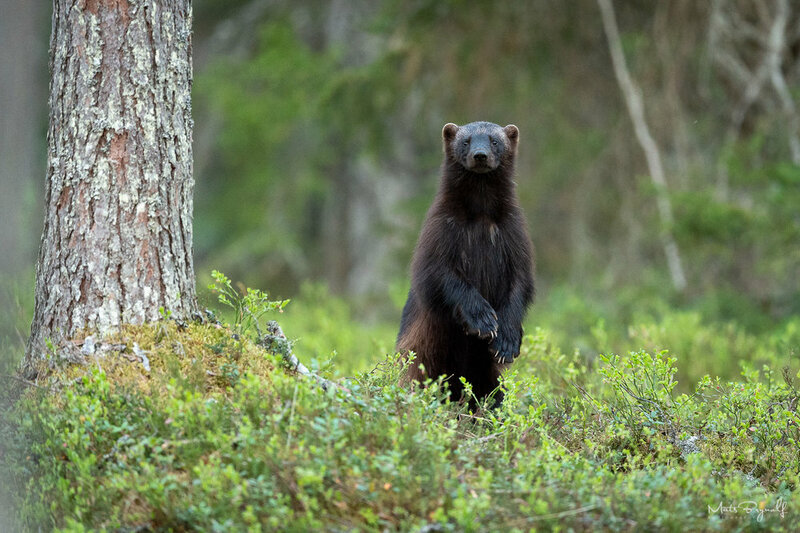 We also had a whole Wolverine family in the area with one yearling cub. If you would like to visit Finland then I would recommend contacting Rovdjursland. This was my third time going to the Kuhmo area in Finland and what a trip it was. 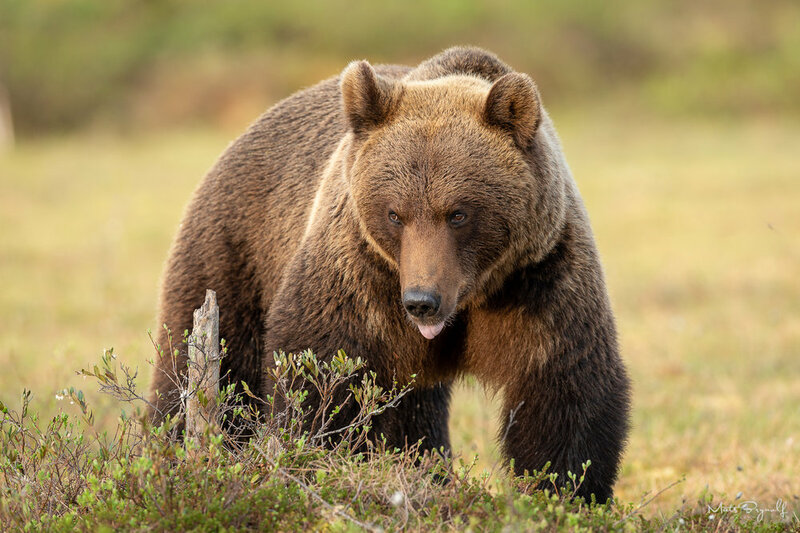 Our first stop was at Wild Brown Bear Centre managed by Ari Sääski. Ari has been doing this for a very long time and has very good knowledge about the wildlife. We arrived in the first week of May, and was a little bit worried about the weather, but it turned out to be perfect timing. We spent half of the time at this lodge and had some of the best Bear encounters I've had so far. For the first time I saw 2 cubs, which was a great privilege. 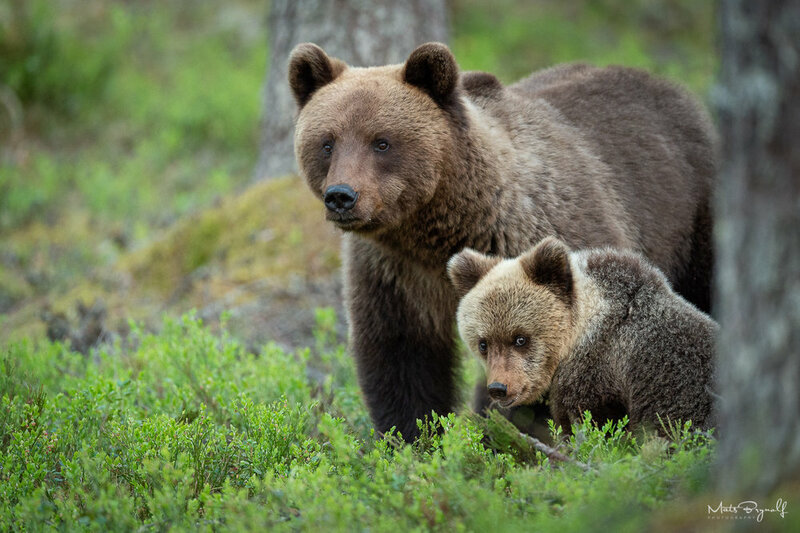 The Bear in the image above is the mother of the cubs. The cubs are just outside of the frame of course. The next few days was spent in Articmedia Kuikka Base Camp. This place is run by father Lassi Rautiainen and son. Lassi has also been doing this for a very long time and created a very nice camp. We spent our nights in different places every time and by far the most exciting experience I had was on the second night in a place called "Paradise" together with Stig Bjök and Tomas Janzon. The evening started out very quietly and not much activity, but a bit later we heard 2 wolf's singing somewhere in the forest. It was hard to to pinpoint their location but what a feeling. I say singing because that was exactly what it sounded like. It turned out that this was the alfa par and soon after we saw them for the first time. This was one of the best wildlife moment I have ever had. The image you see below is the female just as she is coming out from the forest. I just can't get enough of the nature and wildlife in Kuhmo... so I went back in June. This time I only stayed at Wild Brown Bear Centre. As you can see on the image below it's not only Bears, wolfs and Wolverine you can see. It is quite common to see the Red Fox there as well. The Fox is looking out on a small lake with Aris newest hide number 17. Already on the first evening we got to see the mother with both her cubs again. It was a great feeling to see them again. It was a bit of a surprise to see them since this is the breeding season and big males come here looking for females. 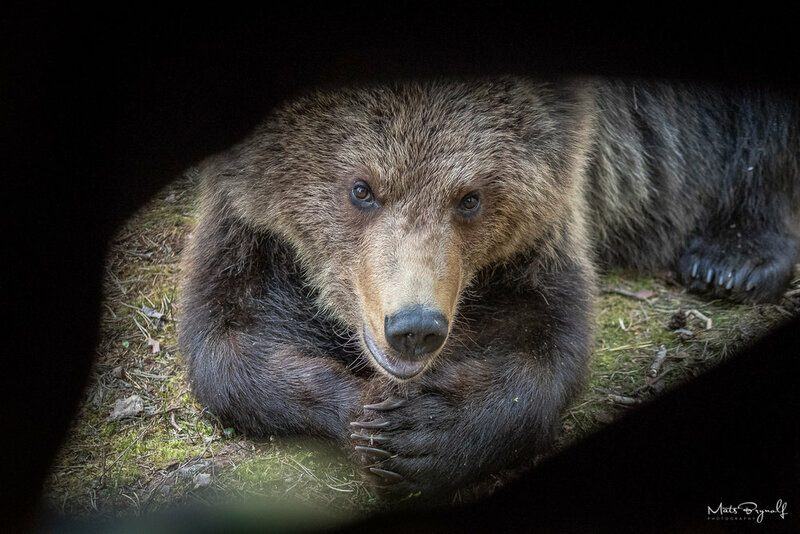 I have had close encounters with bears just outside of the hide before, but this time was different. 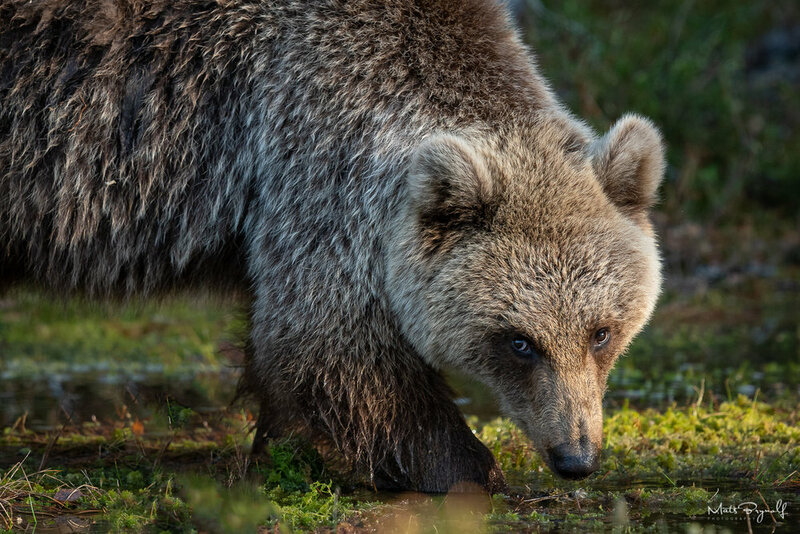 On the second knight Lars Eriksson and me was in the forest hide and at midnight a huge male was just standing outside our hide looking straight at us. 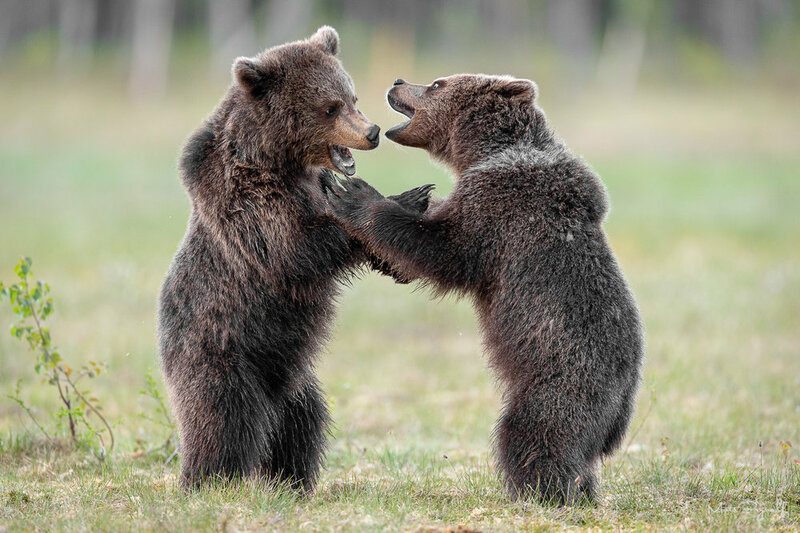 Bears are extremely quiet and they just appear from nothing even though you were looking in the same direction. Ari had placed some food in the tree just a few meters in front of our hide and when he stood up on his back legs trying to get to the food. I almost could not take any images. He was an impressive bear and what a feeling. I just looked at Lars and smiled.